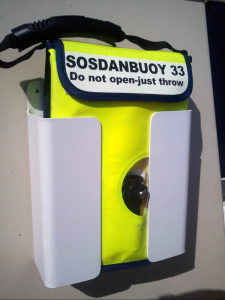 Here is a multi-purpose holder for your SOS Marine dan buoy. It’s made of Kydex-T, a flexible yet durable weather– and UV–light–resistant plastic. Click to learn more about the dan buoy bracket. This entry was posted in Safety at Sea and tagged dan buoy by Test. Bookmark the permalink. Dinghy racing and bluewater cruising sailor.